Our neighborhood has a flock of about 200 peacocks. They've never come to our street; they hang out a few blocks away. We see them almost every day as we head to school or the park. The people in our neighborhood network are divided into two distinct groups: those who love the peacocks (us and everyone in our immediate area) and those who hate the peacocks (those who actually have peacocks in their yards, on their roofs, blocking their driveways, etc.). It's possible that if I were regularly cleaning up peacock droppings and watching them eat my landscaping I might not love them as much as I do. 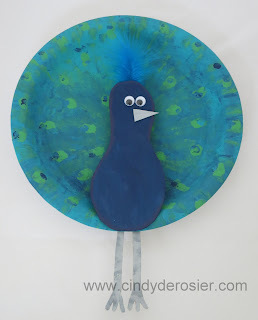 But since I love the peacocks, I decided to make a paper plate peacock. Use a variety of greens and blues to create a background. The colors should radiate from the center out toward the edges. 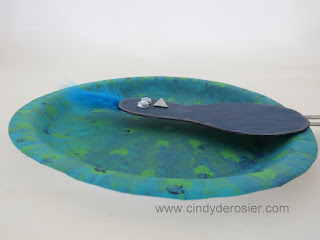 While the plate is drying, cut a pear shape from the chipboard to make the body of the peacock. Paint it dark blue. Cut the scraps to make a tiny triangle beak and long, skinny legs. Paint the beak and legs grey. Use your pointer finger to dot light green evenly on the plate. These will be the peacock's eyespots, so they should radiate outward as well. 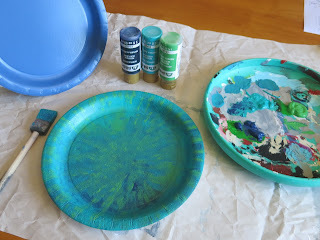 When the light green is dry, use your pinkie finger to put a dark blue spot onto each green fingerprint. I really do love peacocks. I love them ... of course I am related to them ... so I really don't have a choice! LOL!! (Grandma's maiden name is Peacock!! HA!) :) Loveeeeeeeee this!! So fun!!!!!! Cute! You've nailed the colours! P/s: I love the birds at the Bird Park but I wouldn't want to have to clean up bird poop on a daily basis.